A Shadow Bright and Burning by Jessica Cluess. Random House, 2016. Paperback/Softcover. 416 pages. Jessica Cluess' debut novel begins the story of Henrietta Howel, who is believed to be the first, prophesied female sorcerer, a rare quality in the male-dominated world of magicians. As Henrietta begins her training to become a fully-fledged sorcerer, she starts to struggle and second-guess whether she even is the prophesied one. A Shadow Bright and Burning felt both unique and familiar. The overall idea of a protagonist discovering their powers and traveling to a 'school' to learn more with other, more advanced pupils seem like an age-old tale (but I suppose it is popular for a reason). However, the ideas and magic system created feel fresh, and I truly enjoyed reading about every aspect. As mentioned, I am a huge fan of this magic system. It felt very concrete (well, for the most part) and it had 'rules' that overall actually made sense. I liked that there was such a huge difference between what magicians and sorcerers are, and the explanations were fascinating. For instance, magicians create conduits of power with the elements, whereas sorcerers merely act as conductors and alter/etc. the elements. This also perfectly sets up the background for why magicians are inherently seen as being more evil, as they can sort of create their own catastrophes. Henrietta Howel is our main character, and I'm not sure how I feel about her. She's very stuck on tradition and acting 'like a lady,' which isn't necessarily a bad thing, but it got a little old sometimes. However, I did appreciate how bold and unafraid she was, at times, and how she was willing to stand up for herself and own the fact that yes, she is a woman, but no, she is not going to accept your sexist views. I enjoyed many of the supporting characters, such as Rook, Lilly, Magnus, Hargrove, and Blackwood. Hargrove is an incredible character, and I'm pretty sure he is one of my favorites in this book. Lilly is a sweet lady's maid to Henrietta, though I must say she was pretty similar to other lady's maids from other books, so perhaps that just shows Cluess really got the part down. I enjoyed the rest of the characters as well (including those not named here), and I'm sure I would have enjoyed many of the others if I had seen them more. I understand that there's only so much time to have other characters in the fray, but I missed seeing some of the other boys at the 'school' where Henrietta studied. They were always there, but rarely discussed, so when they suddenly become much more prominent at the end of the book, I found myself feeling like they were just sort of thrown in there. There were a few surprises along the way that felt somewhat predictable, but fortunately this didn't really detract from my enjoyment of the book. 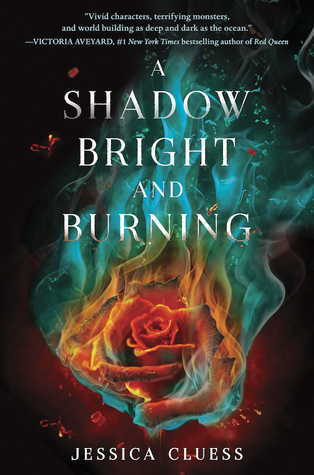 A Shadow Bright and Burning was so entertaining and well-written that I didn't care about a few of the cliches or stereotypes used. And while most people like to complain about love triangles, I'm not sure I minded this one, - and I'm not sure if I would even call it one - simply because it wasn't prominent. It definitely wasn't at the forefront, and there was never anything overtly annoying or in your face about it. Sure, flirtations and romantic interests were apparent, but it wasn't like most of the dreaded, constantly fretted about love triangles found in other books, so please don't let reviews that mention this take away any potential interest in reading this book. Lastly, I'd just like to touch on Cluess' world building. This world was great to me, because it was set in a realistic world in what feels like the nineteenth century, complete with mentions of historical events and even America, but it was also fantastical and full of a magical background/lore that flowed perfectly throughout the setting. This was honestly a really fun and enjoyable ride. I truly enjoyed learning the lore, the history of the magic, and the rules and how it is and can be used. Cluess has created a truly exciting world that I cannot wait to read more of, and thus I am giving A Shadow Bright and Burning four stars!